One way to make a fountain imposing but not too ostentatious is to have a wall of water. 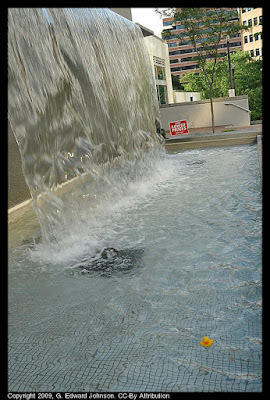 Stop 4 on our Bethesda fountain tour brings us to another of the fountains at Bethesda Metro Plaza in Bethesda, MD. This one is right next to the Quiznos. The water flows over the ledge in a solid sheet, becoming wavy as it reaches the bottom pool. On a hot day you can feel a slightly cool breeze coming from it, but on windy days drops of water can reach over to the tables. Read all of the Bethesda fountains series. When will Elm Street Park be finished?